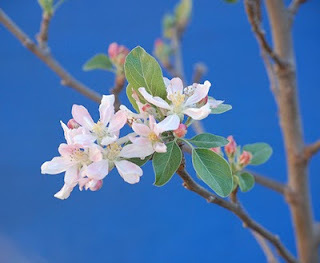 I recently returned from Baja on assignment for the radio program "The World." After visiting Baja's first wind turbines and talking with members of a land cooperative (Ejido), I traveled the length of the Sierra Juarez, from La Rumorosa South 30 some miles on rutted dirt roads into Paque National Constitucion and the placid Laguna Hanson. The range is topped by a gorgeous Jeffrey Pine forest and the Laguna, the lake pictured in this slide show below. As you can see, the flora here is a fascinating mix of plants you might recognize from the US side of the border and some endemic species. 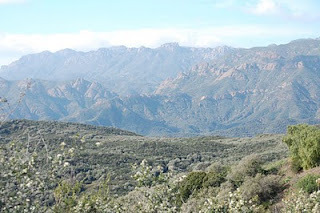 Coastal sage scrub and chaparral intermingle with Sonoran species at lower elevations. Manzanitas abound and are mixed with red shank--the shrub pictured here with manzanita-like bark and fine, needle-like leaves--and junipers. Due to road conditions, my traveling companions and I had a bit of an adventure--prompting me to wonder if we could survive on frosted oatmeal cookies and pee. Video on this to come. Click here for a large-screen version of the slide show. The Arboretum will showcase sustainable plants at its annual L.A. Garden Show, which runs from April 30 through May 2. Organizers include the Arboretum’s new horticultural curator, Jill Morganelli. The garden’s aesthetic is partly sculptural — curvaceous succulents alternate with twisting branches and thick tree trunks. Largely absent are beds of rotated, brightly colored annual plants common at nurseries. Morganelli says the Arboretum’s signature bird, the peacock, is partially responsible for the look –– it’s an inadvertent “watchdog” of sustainability. 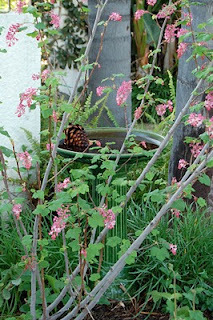 “With annuals — plants that typically live for four to six months –– you’ll just waste all kinds of time and manpower,” she observes, “and they’ll be picked to the ground by peacocks.” She adds that annuals are generally water-hungry plants. tralian plants are especially sensitive to phosphorus. In addition to the exemplary plantings, the Arboretum is inspiring a new wave of sustainable gardening with classes that are substantive and varied. 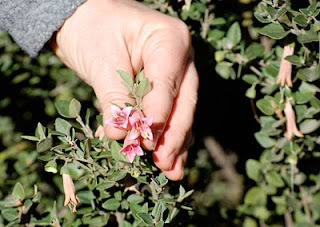 This is a cultivated plant (a cultivar) bred from one of the 250 plus species of wild Grevillea. It unfurls intricate clusters of hook-shaped, salmon-colored blossoms. “If you want to get rid of your lawn--and don’t have kids or a dog,” says Morganelli, “look at some of these low-growing shrubs.” She also admires the yellow-green color of the foliage. 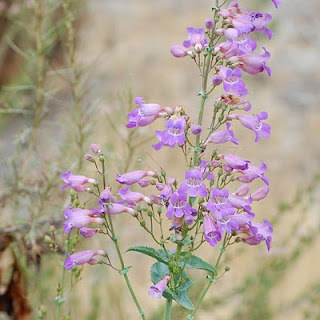 Also known as showy or royal penstemon, this herbaceous plant dazzles with three- to six-foot tall flower stalks, covered with dozens of blue, purple or pink flowers. “I think of penstemons as my answer to foxgloves,” says Morganelli. That’s a fancy name for a modest plant known as narrow-leaved Milkweed. “It’s not a beautiful plant all year,” says Morganelli, “but it’s a food source for monarch butterflies.” She advises planting it near the back of a bed, and waiting for the gorgeous black and white striped caterpillars to turn up. Scientifically, this group of plants goes by a tangle of names, but they are easily identified as monkey flower. Hikers recognize some of them from local trails. Some can be hard to grow and are short-lived; Morganelli recommends the yellow and pale orange shrubby kind. The big bloom has begun around my yard. February through June is prime flowering time. Here are a few highlights, including Anna apple (above). At the other end of the spectrum: volunteer sunflowers (from the bird feeder). 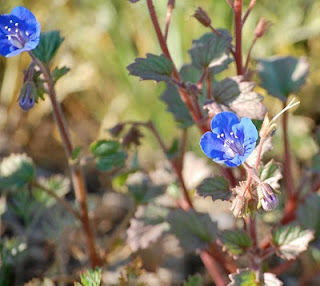 Desert Bluebells (Phacelia campanularia) are great for hot spots and easy to grow. You can find Botanical Interest seeds at many nurseries. and viburnifolium (below). The latter has such tiny flowers, they're easy to miss. R. aureum (Golden currant) is especially easy to grow and will reseed readily in the garden. I like to snip small branches and bring them in for a small, delicate arrangement. This year I added the Ribes cultivar 'Dancing Tassles' to my garden. 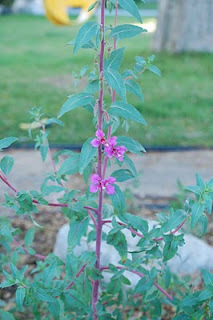 It's similar to sanguineum glutinosum (above) but with even longer, dangling flower heads. 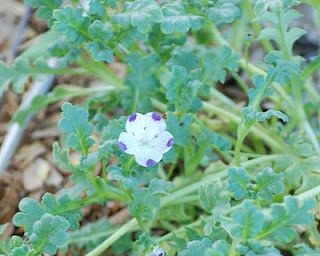 Another petite blossom that sets my pulse racing is five spot (Nemophila maculata), pictured below. I also adore its cousin baby blue eyes (Nemophila menziesii). I bought my seed at the Theodore Payne Foundation. The foundation now has a native plant Wiki, a source for pictures and information on plants you hear or read about. 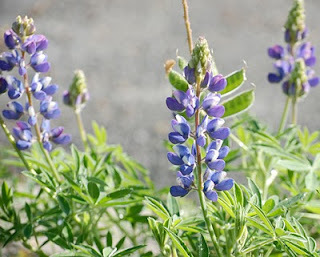 Lupines are really taking off now. And elegant clarkia (Clarkia unguiculata) has reseeded itself around my garden. Last year I wrote about a gorgeous native plant garden for a local magazine. The piece was a general interest story on gardening with the California flora, but the homeowner and garden's designer, Eric Callow, impressed me with his enthusiasm for what I sometimes regard as the dismal science: irrigation. Callow, a financial adviser and member of the Rancho Santa Ana Botanic Garden board, had transfered is his talent with numbers and spread sheets to the garden, calculating exactly how much water individual plants in his garden needed. When my wife Elisa and I were looking for a home eight years ago, we had the good fortune to find a mid-century modern house designed by Lloyd Wright Jr. 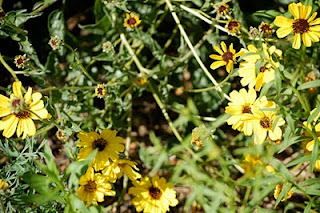 The house came with twenty thousand square feet of yard begging to be re-landscaped and I already had a deep interest and some experience with California native plants. So, it was the perfect opportunity to design and install (with help) my own California native garden-including hundreds of feet of irrigation pipe and tubing. The garden has matured wonderfully in many ways over the last five years and has been included on the Theodore Payne native garden home tour over that period. Certain areas in the yard have been real challenges, however, with apparently healthy plants just up and dying or other plants hanging on but not prospering. I decided it was time to consult an expert, so I called horticulturist Lili Singer. Singer is special projects coordinator for the Theodore Payne Foundation, where, among other things, she produces the above referenced home garden tour. 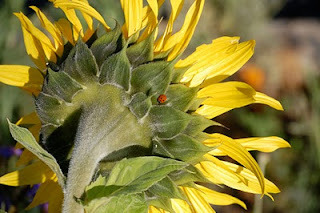 As she checked on my garden, noting a variety of problem plants and areas, a clear theme developed: most of the time, the problem lay in how the plant was being watered. It was not just a matter of too much or too little either; Lili also analyzed cases of inconsistent watering (too much, trying to make up for too little) and uneven watering (supplies not reaching some of the roots). As a result, I’m reviewing and revamping my garden irrigation system, circuit by circuit, again. Now, not everyone wants to start digging up and replacing valves and sprinkler heads, let alone laying pipe, but two issues argue for at least understanding some of the big concepts. For one thing, we’re all going to be pressured to use less water in the years ahead. In fact, the package of water bills recently passed in Sacramento stipulate that urban users will reduce their usage by 20% and local water districts are required to have a plan in place to do so sometime this year. The legislation raises some serious issues regarding the justice and necessity of singling out urban users, but there’s no question that we as gardeners need to do our part to save water. Secondly, in my experience, the average hired gardener can’t be trusted to know what they are up to when it comes to analyzing or designing an irrigation system. Indeed, I’ve had to rework an extensive drip system because a professional landscape contractor’s employee didn’t understand the following precepts. So, here are what I consider to the big concepts for understanding garden irrigation. 1. Hydro-zone: an area of plants with similar water requirements, watered by a single irrigation valve and circuit of spray heads, drip emitters, bubblers et cetera. The valve is like an electrically controlled faucet. When the controller/timer tells it to turn on, water is released into the circuit of pipe or tubing and distributed over the area being watered. 2. Efficiency: laying down water evenly over the hydro-zone and only in the hydro-zone. 3. Pressure: the force, measured in pounds per square inch (PSI), available at the irrigation valve. 4. Flow: the volume of water that will flow to the hydro-zone at a given pressure. 5. Precipitation: the amount of water delivered to an area (hydro-zone) measured in inches. A hydro-zone can be simple, like a rectangle of turf, or complicated such as an irregular shape or even overlapped. It boils down to a grouping of plants that can be efficiently watered from a single valve. For the health of your plants-and your own sanity-you want to place plants together that need similar amounts of water in the same seasons. Efficiency has to do with getting water to all the plants in the hydro-zone and not to anywhere else (like the driveway, etc.). Even application is important too since an under-served section of the zone will force wasteful over watering of the remainder. Professional irrigation designers assume that their best design for placement of the sprinkler heads will be only 90% efficient. I think a well designed low-pressure drip or micro-spray (think of a tiny spray head as opposed to a pop up sprinkler) system can do better. If you use more heads or emitters, each covering a smaller area, you can cover an area more precisely. The pressure depends first of all on what your utility delivers. It’s usually too much, so you will likely already have one or more pressure regulators to reduce it to something manageable. For example, I have 185 PSI at the street, which is reduced to 75 PSI in the yard. That’s still way too much for the faucets inside the house, so there’s another pressure regulator to bring it down to 25 PSI. So, if your irrigation isn’t working well, the first thing to do is to check the pressure with an inexpensive gauge that screws onto a garden faucet. If it’s really low, maybe someone ran your garden plumbing from inside the house! More often than not, however, the problem is not pressure but flow. Water flowing through a pipe creates friction and turbulence so that the more one tries to cram through it, the more pressure is lost by the time it reaches the other end. Even if the pressure can be increased, there’s only so much water you can get through pipe of a given diameter. Irrigation designers refer to charts to tell them how much of the pressure they’re starting with at the valve will be lost for every 100 feet of pipe the water is being pushed through. Let’s say your irrigation circuit is designed to pump out ten gallons minute (not unusual), but the water is being pushed through 100 feet of half inch pipe before coming out the heads. The result will be really anemic because over 30 PSI will have been lost before the water gets to the sprinkler head. If there’s 200 feet of pipe, over 60 PSI will have been lost-perhaps more than you had to begin with! Of course, whoever designed the system should have used three quarter inch or even one inch pipe, but believe me, this sort of thing happens all the time. When the weatherman says we had an inch of rain, it means that a baking pan left outside would have that depth of water in it: that’s precipitation. Precipitation is also how irrigation is measured, that is, in inches of water per month. 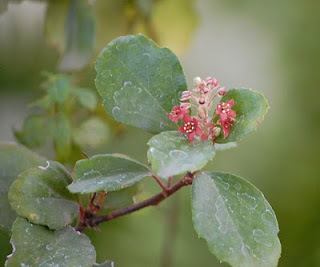 For example, according to WUCOLS III (a water-use classification of landscape plants created for the California Department of Water Resources) an area of low-water plants--buckwheat, sage, ceonothus and the like—in Pasadena needs about two inches of precipitation in July. 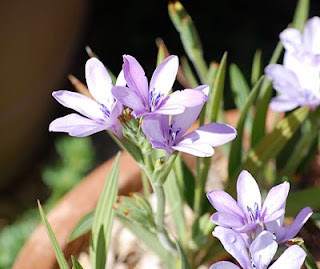 This may be more than the plants need to survive, strictly speaking, but is meant to be an estimate of what they need to be healthy and look good in a garden setting. In any case, I am convinced that having an efficient irrigation system controlled to deliver planned amounts of precipitation is a least as important as your choice of plants in saving water. Of course, most people will continue to estimate water needs by the old “seat of the pants” method, but I predict that as the conservation screw keeps getting turned, measuring precipitation will become the norm. How to do that is another conversation, complete with charts and graphs, which I’m writing up for the second installment of Irrigation Insights. A couple weeks ago, friends invited us to explore tide pools at El Matador State Beach during an unusually low tide. How could I pass? My son has touched sea stars and other marine invertebrates at the Aquarium of the Pacific, but he's never seen them in the wild. It was a long haul from the San Gabriel Valley, but the drive through the Santa Monica Mountains alone was worth it. I gasped at the view above, looking west from Decker Road (Highway 23). I thought, "Tuscany has nothing on these mountains." This route isn't the quickest over the range, but it's a gorgeous drive. 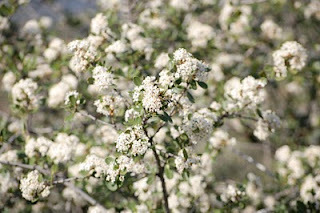 The white ceonothus studding the hillsides glittered like diamonds. Sadly, much of the roadside is lined with invasive, nonnative fountain grass (Pennisetum sataceum) that has escaped gardens and threatens rare habitats. 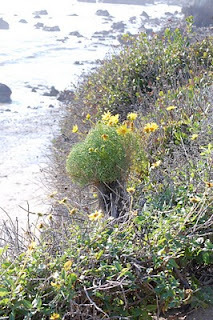 At El Matador, Giant coreopsis (above), bladderpod, and California encelia were in bloom. Cormorants sunned themselves on the rocks, and brown pelicans took a few exciting turns over our heads. 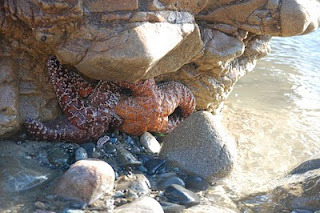 I pointed out several ochre sea stars (Pisaster ochraceus) to my son. Don't be fooled by their sedentary appearance, these fellows are accomplished hunters. They travel around on their tubed feet, attach the little suction cups to mussels, and slowly pry open their prey. Once it cracks an opening, the sea star injects its stomach into the mussel, chows down, and retrieves stomach. We also saw quite a few anemones, but they had contracted their tentacles, blending in with the rocks. If you visit intertidal ecosystems, do so very carefully. People I observed on this visit seemed unaware of the camouflaged anemones and likely stepped on some. A few years ago, I interviewed UCLA ecologist Rich Ambrose about intertidal habitats in L.A. County. He told me people are collecting or stepping on just about every kind of animal in and around tidepools. He pointed to a fluid, deep purple sea slug: "This is an animal that’s really heavily impacted by visitors because as you can see it’s very soft bodied. People don’t see them and step on them and they squish." People are also taking starfish home as souvenirs. And they’re illegally snagging crabs, sea urchins, sea cucumbers and other animals for their own dinner tables, or to sell to restaurants and aquarium stores. Ambrose’s research has found that about six percent of visitors collect something. That doesn't sound like a lot, but consider about 30,000 to 50,000 people a year will visit a single site. When I’ve tried to talk to them they’re not interested in hearing it’s not legal. They’ll collect big crabs that are uncommon. At one point we saw somebody drive down a pick up truck and was just filling up the back of the pickup truck with sea urchins. 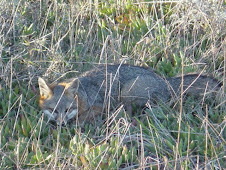 Needless to say, the state lacks sufficient game wardens and park rangers to protect resources. On our Saturday visit, El Matador was entirely unstaffed. All the more reason for those of us who can't hold our tongues, to keep our eyes open. 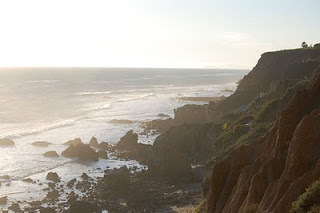 El Matador is located in north Malibu at 32215 Pacific Coast Highway.